Glenwood Garth is located just outside of downtown Bel Air n the heart of Harford County. Just off East Macphail, Glenwood Garth is a single family home community built in the mid 1980’s with just under 150 total housing units. While Glenwood Garth is outside of the Bel Air city limits, it is still within the 21014 zip code. I actually grew up on Fallen Stone Court in Glenwood Garth for my elementary school years all the way though high school, so needless to say I know quite a bit about the neighborhood. Minutes from downtown Bel Air, Glenwood Garth offers homeowners quick access to main throughfares, such as, Route 24, Route 22, Route 549 and Route 1, and only minutes from Interstate 95. View homes for sale in Glenwood Garth. The quality of a school can greatly influence home values in an area. Currently, Glenwood Garth is zoned for Homestead/Wakefield Elementary School, Bel Air Middle, and Bel Air High School. To find out local school scores, ratings, and more make sure to check out the Harford County Schools Reports on my website. School zoning changes regularly, so make sure when looking for your next home that you are checking with local school boards for the proper school zone you are entering. For assistance with this, contact us today and we can direct you in the right direction 443-360-0086. The data being used in this market report is consolidated from several sources and includes active listings, sold listings and past market trends. Whether you are looking to buy or sell in Glenwood Garth, this report can be a great resource in researching your area. Use the community Info tab to check out great information on local shopping, health care providers, places of worships, restaurants and other local attractions. If you’re venturing out to search for homes, I would suggest checking out some of the great local restaurants in downtown Bel Air, including Magerks, Looney’s Pub and Bar, or one of my personal favorites La Tolteca (get the #105!!!) Also included are links to local libraries, government offices and more. 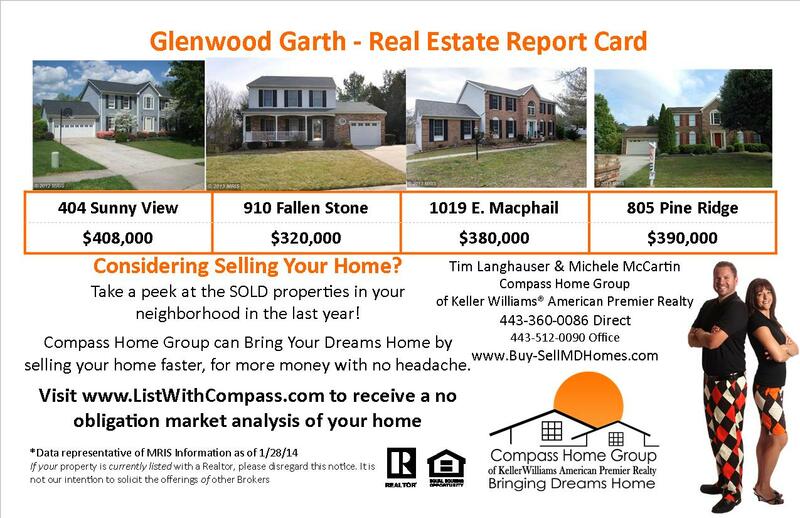 So make sure if you are in the market for homes in, or around, Glenwood Garth, to contact the Compass Home Group at 443-360-0086. As you can see below, we have compiled the last 4 homes to sell in Glenwood Garth over the past 12 months. Obviously, with close to 150 homes, and only 4 selling, the turnover in Glenwood Garth is low. As you can see the homes usually range in the upper $300’s to the lower $400’s, with some of the smaller ones selling for less. Of these four homes, the average sales price came in right at $374,500, reflecting 96.23% of the original listing price. The average days on market for these four homes in Glenwood Garth was 79, right in line with the Harford County average. Compass Home Group is proud to say that our average days on market in Harford County was 53, almost 4 weeks faster than the average! If your interested in what your home would sell for in today’s market, visit www.ListWithCompass.com. This entry was posted in Uncategorized and tagged compass home group, glenwood garth, glenwood garth bel air, glenwood garth homes, IFTTT by tlanghauser. Bookmark the permalink.